With Pablo Sandoval scheduled to miss plenty more action -- at least several weeks worth -- the Giants have a pretty big hole to fill at third. Conor Gillispie's been charged with plugging Panda's shoes, but it appears that Bruce Bochy could end up utilizing a number of different players at the hot corner. Baggs points out that Bruce Bochy was kind to Gillispie -- "you know, he's done all right" -- but much more excited about Arias, the pop-up aside. And then there's Freddy Sanchez, who's "50-50" to return in May, and who has been playing third base during extended spring training action. According to Hank Schulman of the San Francisco Chronicle, the Giants are absolutely considering using Sanchez at third base as they wait for Panda to return from his hamate injury. 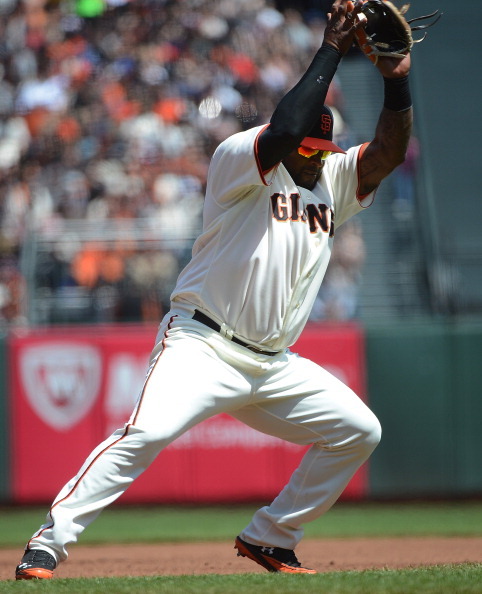 The biggest problem with moving Sanchez to third is that he might not even be back that much sooner than Sandoval. Regardless of his timing though, it's pretty clear that Gillispie isn't going to get every single AB at third moving forward.